Ceviche is a dish from Peru so it is believed that consists of fresh raw fish cured in citrus juices, such as lemon or lime, and spiced with ají or chili peppers, chopped onions, salt, and cilantro or coriander. 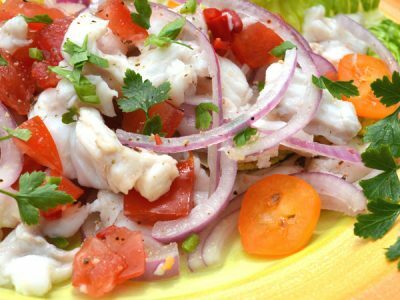 Interestingly enough ceviche was thought to have been brought to Latin America by Moorish women from Granada in Spain, who came to the Americas with the Spanish conquistadors. Ceviche has now spread across Latin America and is pretty mush popular world wide now. I had never actually tried ceviche until last summer when I was developing special recipes for a Dr. for his weight loss program. I came across several ceviche recipes and then tried it out for myself. It was awesome! You can use most hard white fish, they are best, but prawns, shrimp and lobster are also popular. Ceviche is so simple to make, but if you have a problem with eating pickled fish, as this is basically an exotic version of pickled herring, then simply steam your fish or seafood lightly first before marinading in the lime juice. In a large glass bowl, combine the fish or shrimp, lime juice and onion. The juice should completely cover the fish; if not, add a little more. Cover with cling film and place in the fridge for about an hour and a half to cook the fish. Remove the fish and onion from the lime juice (discard the juice) and place in a fresh bowl. Add the chilis, tomatoes, coriander add a drizzle of olive oil, stir gently, then season with a good pinch of sea salt, black pepper and caster sugar. This can be made a couple of hours in advance and stored in the fridge, but not definitely on the day. Serve with tortilla chips to scoop up the ceviche and enjoy with a glass of cold beer or seriously chilled chardonnay.